Change in plans; North Coast 24 here I come! I have decided to enter the North Coast 24-Hour Endurance Run here in Cleveland, Ohio. The race will be held Oct. 3-4 at the scenic Edgewater Park overlooking Lake Erie and will serve as the 24-Hour National Championship. The route is a flat and paved .9-mile loop. Unless you've seen Lake Erie with your own eyes, you couldn't possibly know how beautiful it is. This will be a very nice venue for a 24-hour race. That time of year we'll have about 12 hours of daylight and 12 hours of darkness. 1) I have never run in a 24-hour race and have wanted to for the past two years. In fact, last year I almost created my own 24-hour event in Cleveland to raise money for University Hospitals Rainbow Babies & Children's Hospital (I work at University Hospitals in fundraising)--but those plans never came to fruition. I may explore ways to raise money for Rainbow and/or another charity through North Coast. 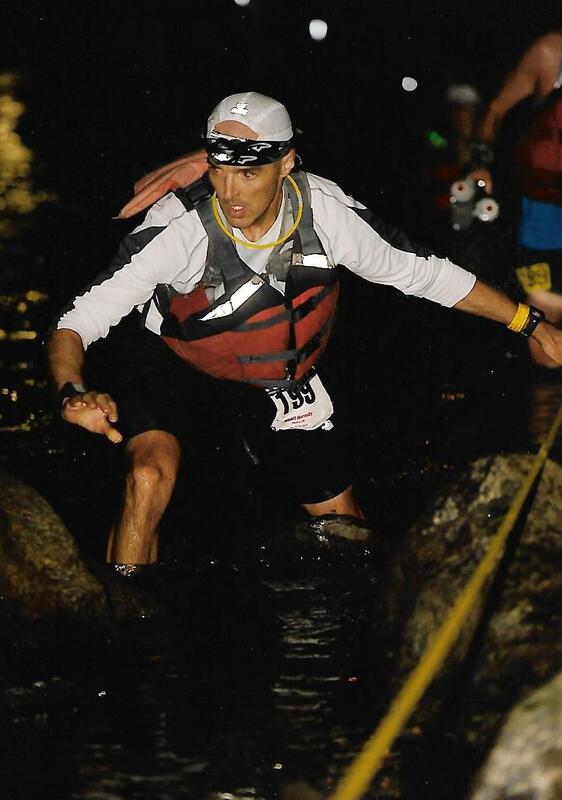 2) In my opinion, the 24-hour race is probably ultrarunning in its purest form. Modern-day American ultrarunning's roots go back to the famous six-day races in Madison Square Garden in the late nineteenth century. I love ultrarunning and everything the sport stands for and symbolizes, and want to experience it in its purest form. 3) I want to support Cleveland and Northeast Ohio as a mecca of ultrarunning. From the Mohican and Burning River 100s to other events, we have many premier ultramarathons and many top ultrarunners here in the northern half of the Buckeye State. We used to have another major event, the Olander Park 24-Hour Run in Sylvania, which served as the 24-hour national championship for years and attracted the likes of Yiannis Kouros. It was at the 1999 Olander that Mark Godale, a native Clevelander who I run with in the Cleveland Southeast Running Club, set the American 24-hour record at 162.4 miles--a record that still stands today. Now that a 24-hour national championship is back in the Cleveland area, I want to be a part of it because this opportunity may not happen again. 4) I want to do another 100-mile event this year. I was unable to run in the Burning River 100 because I'd already committed to being a pacer, and I don't think I was quite ready for the distance with Mohican being just six weeks prior. 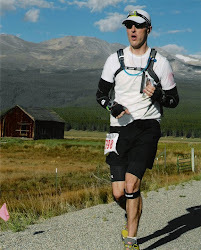 I've scoured the schedule of 100-milers for the rest of 2009 and, due to a variety of reasons, the North Coast 24 is perfect. It will likely, of course, involve far more than 100 miles. Beyond those reasons, I'm excited about taking part in a national championship event. I imagine many top ultrarunners nationally and even internationally, as well as an excellent group of runners from the region, will be at the North Coast 24. Because I've never done a 24-hour event, it's hard to come up with specific goals for North Coast. I guess I'd like to go north of 130 miles and potentially go under 17 hours for my 100-mile split. It would be nice to also establish a 50-mile PR. Most of all, I just want to experience what it's like to go for 24 hours. To prepare, I'm going to get back into high mileage starting this week, building on my fitness from my Mohican 100 training. I've been in a 70-80-mile per week zone for the past few weeks and will now begin working up to near 100 miles per week. The goal this week is 90 miles. I may not hit 100 miles at all going into North Coast, but I'll be in the 90something zone and will continue with my hill repeats and speedwork, which will come in handy in December when I run in the North Face Endurance Challenge Championship Gore-Tex 50-Mile. For the first time in a few months, I'm really excited about my running and feel like I now have something to drive toward. For whatever reason, I wasn't that psyched about the Tussey Mountainback, but I'm definitely stoked about the North Coast 24 and feel completely energized. This will be a huge challenge but one that I look forward to. I spent a large potion of the training week doing some different things. From Thursday morning through Friday late night, my focus was on working with Ted F. to mark the Burning River 100 Mile Endurance Run course from the Polo Field aid station to the Harper Ridge aid station. This is about a 6-mile stretch mostly along horse trails. Ted and I got out on Thursday morning for three hours and marked about two-third of the stretch, using lime, pie plates on stakes and orange flags. To carry our supplies, he used a baby jogger and I used one of Noah's strollers. That night we finished up in about 90 minutes, feeling really good about our section. And then the rain came. Lots of it. I woke up on Friday morning at around 1 or 2 to sounds of a massive downpour--which wasn't in the forecast. I guess it was what they call a "rogue thunderstorm." I felt sick to my stomach. Ted and I were planning to run from the Polo Field to Harper Ridge on Friday night just to check the section over and fix problem areas--a "run-and-check." Those plans were now out the window as the rain had washed away most of the 50 lbs. of lime we laid down. So Friday night's scamper turned into one of re-marking several areas of the course where the lime was now gone. Fortunately, it wasn't too bad. All of the pie plates and flags were still up. A few more flags and plates here and there and we were done! Afterward, we celebrated at the Rusty Bucket in Solon. There we sat at about 11:00 p.m.--me chomping on an enchilada and Ted on some mac and cheese while we both enjoyed well-deserved cold brews. Our efforts paid off. The section of the course we marked was perfect. I now hope the eight hours I invested in this endeavor will count toward my volunteer hours for both the Buckeye 50K and potentially the Western States 100, assuming I go out West next summer. On Saturday at the Burning River 100, I paced last year's champ, Tim Clement, a fellow Southeast Running Club member who I train with on Saturday mornings in South Chagrin Reservation. Tim had a great race, finishing third overall in 18:35. I went the last 30 miles with him, feeling really good the whole way except for the fact that I should have worn road shoes instead of my Salomon Speedcross 2's. Mark Godale, also of SERC and the 2007 BR100 winner, won the race with a time of 16:17. I saw Mark come into the mile 70.3 Happy Days aid station and he had the look of a someone who was locked in. 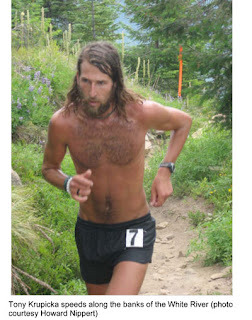 Jay Smithberger, winner of the 2008 Mohican 100, finished a very strong second with a time of 17:58. And a big congratulations to Connie Garder, who once again was the top woman at the BR100 and finished fourth overall. I saw Mark and Jay at the finish line after Tim crossed. 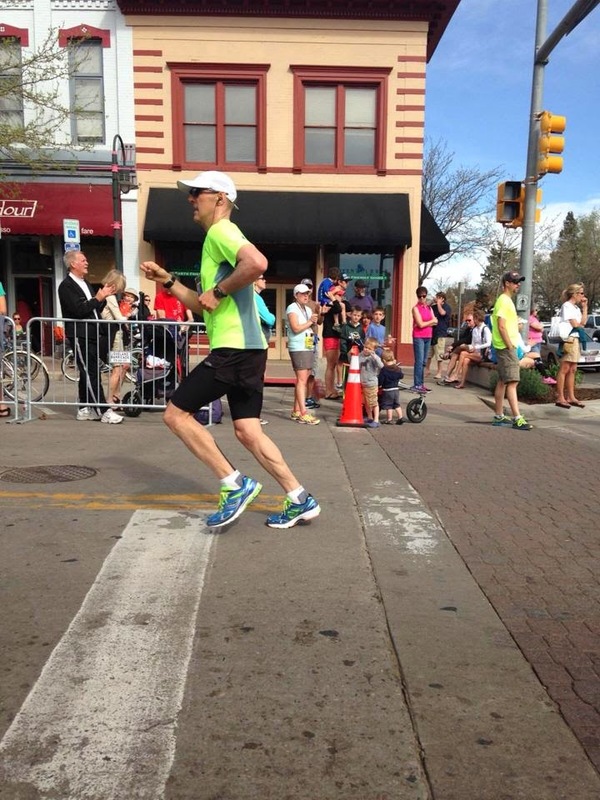 I hung out at the finish line in downtown Cuyahoga Falls for about a half-hour and then headed home. On the drive back to Chagrin Falls, I got really hungry...but where to eat past midnight? I didn't want to stop at a sit-down restaurant and I didn't want to make something when I got home, risking waking up Noah. So I figured drive-thru was the only option. I stopped at the Burger King in Solon and ordered a #1 "value meal," which included a (delicious) Whopper, french fries and a Sprite. I sat in the parking lot as I stuffed my face. I HATE fast food because of what it represents and what it's done to America (obesity), but damn was this good. I can't decide what's better--the Whopper or the Big Mac. Back to the BR100. Congratulations to the following other friends who finished the BR100: Jim Chaney, 19:52/master's winner; Marc Abramiuk, 20:06; Rich Henderson, 21:40; Greg Dykes, 22:45; Dawn Malone, 23:10; Frank Duchossois, 25:35; Dave Peterman, 29:00; and "Wild" Bill Wagner, 29:17. Complete results can be viewed by clicking here. This week I logged only 75.6 miles but spent many, many hours on the my feet marking the course and went the 30 miles with Tim. I had a great hill-repeat workout on Tuesday and was forced to skip Friday's track workout due to course-marking. My goal this week is 85 miles with good hill and track workouts. I look forward to my next big race, the Tussey Mountainback 50-Mile in Pennsylvania. It should be a lot of fun and a big challenge.